SPF/DKIM records are industry-standard security mechanisms that authorize Front to send emails on our customers’ behalf. When you add a SMTP email channel, it’s critical to correctly configure SPF/DKIM records for your email domain because they reduce the risk messages you send from Front will be marked as spam in your recipients’ inbox. SPF/DKIM settings do not impact your ability to send or receive emails in Front. If you have validated your email channel in Front, any emails received by that domain will appear in Front. However, these settings are important to ensure that emails you send from Front are not marked as spam in your recipient's inbox or caught in their spam filters. 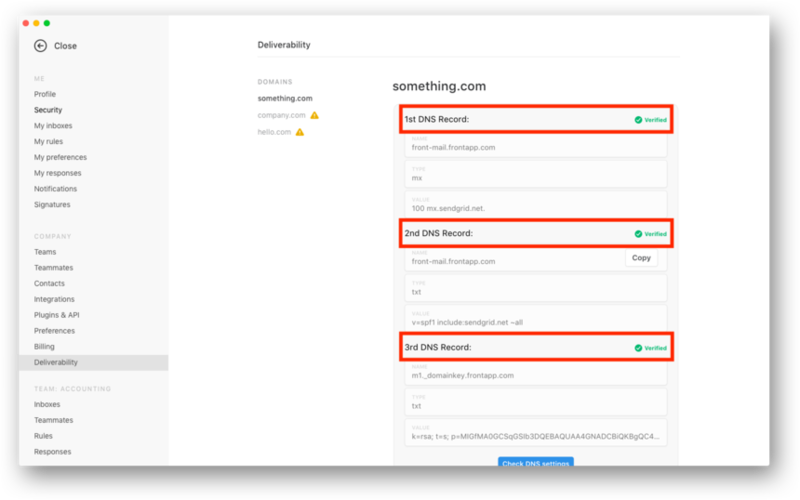 We will display warnings to keep this top of mind if you have not configured your SPF/DKIM records for channels that require them. If you are using a Google Group or other channel using email redirection, you should add SPF/DKIM records for your domain. If you are using a Gmail personal account channel, or Office365 sync channel, you do not need to worry about SPF/DKIM records as we rely on the Gmail and Office365 APIs to send and receive email. . Whenever there are missing SPF/DKIM records for an SMTP channel, all members of the team will see prominent warnings in the app indicating this set up step has not been completed. 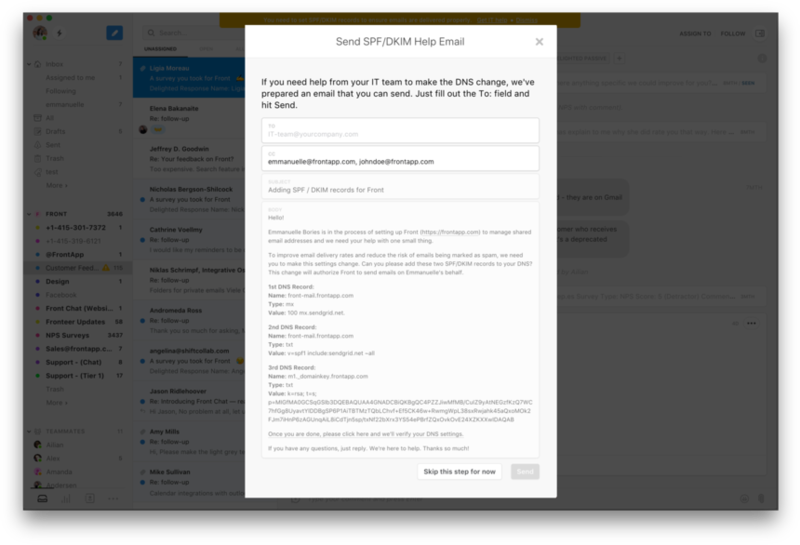 Follow these steps to add your SPF/DKIM records for each domain you are using to send emails from Front. 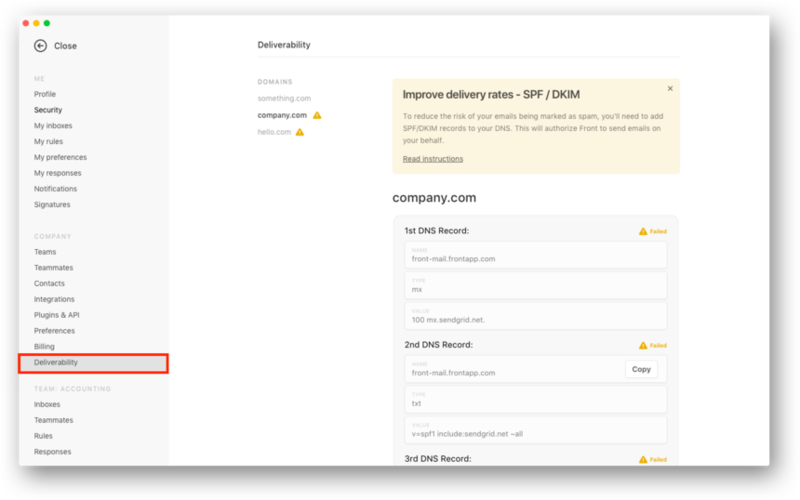 There is one Deliverability settings page visible to company admins where you can configure records for all your email domains in one place. If you are not a company admin, you will not see this settings page and will need to get your admin’s help. Click on the Deliverability tab. Here, company admins can configure SPF/DKIM records. This page will only be visible to company admins after they add at least one SMTP channel. You will see a list of your SMTP channel domains under Domains on the left. Any email domains with missing SPF/DKIM records will have a yellow warning icon. When you’ve successfully added the SPF/DKIM records and you click the “Check DNS settings” button, the warning icon will be removed from the channel name in the list and the DNS records will say “Verified”. If an SMTP channel uses an email domain that does not have SPF/DKIM records set, a warning will appear in your inbox where that channel is housed. When you click into the inbox, there will be a banner across the top explaining the issue. 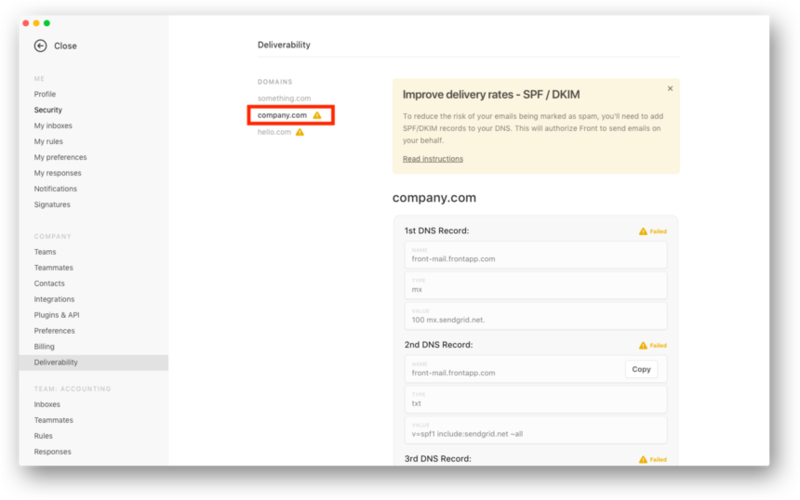 If you are a company admin, the banner warnings will be linked to your Deliverability settings page, where you can configure your SPF/DKIM records. If you are a team member or team admin, you will get a popup with a template email to send to your IT team and your admin because you do not have the appropriate permissions to make these changes. A warning icon will also be shown on the inbox in your inbox settings. This will be shown for all team SMTP channels and individual inboxes where the SMTP channel is the same domain as a team channel. 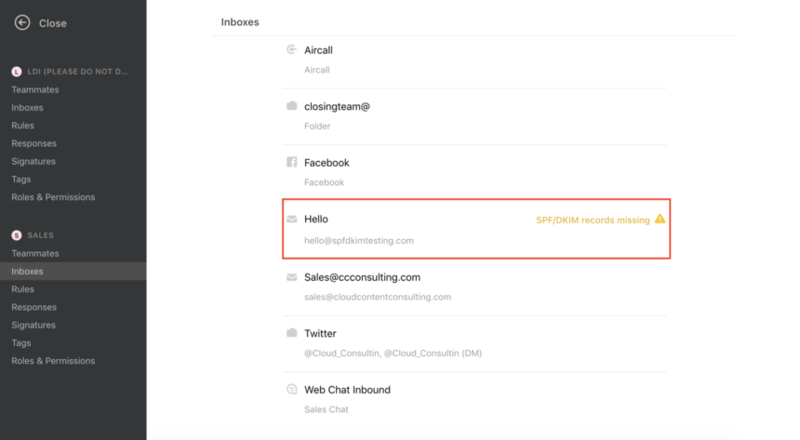 If you have set up an individual inbox with a different email domain (i.e. a “non-work” email), these warnings will not be displayed. Note: cPanel, Wix, and Squarespace don't support creating MX records. You guys should really add this link to the very helpful "Get IT Help" draft email. There should be no need to get in contact with you all if this support article is provided! Hi Victor, thanks again for the feedback! We've made this change. For what it's worth, here are my settings for updating the DNS using Linode. So what happens if we use Wix then? Do we just do nothing? Jesse Parker Yes, you do nothing. We can remove the warnings on your account. Please email support@frontapp.com to request this. Why does adding the 3 SPF records to our DNS allow for a influx of Spam emails to come into our system? Shana Eccles Adding these records will not affect the amount of spam you receive. 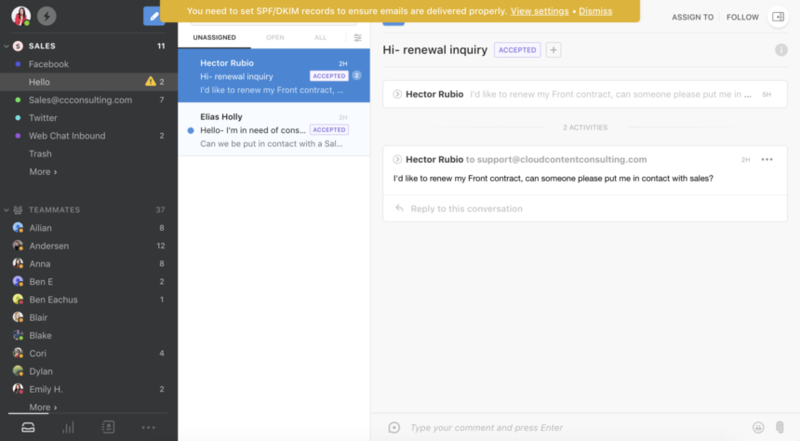 The records affect the deliverability of the messages you send only. You can take a look at our Understanding Front's spam feature guide to understand how spam works with Front. Hi, can you also provide instructions for Gmail? Elvedin Cokić Please contact us at support@frontapp.com and we will assist you with the set up of your SPF records directly.